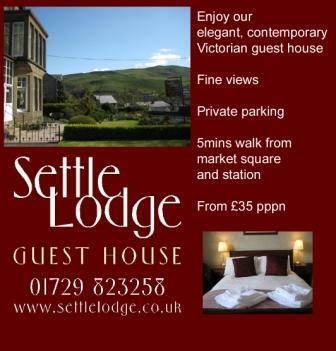 Settle Lodge is an elegant and luxurious Victorian residence with its own private parking to the rear. Contemporarily styled and offering every modern comfort it is set in an elevated position and boasts panoramic views of the surrounding fells. Only 5 minutes walk is the bustling centre of the market town of Settle with its interesting mix of shops, cafes, restaurants and pubs. Also only 5 minutes walk from the station for the increasing number of guests who are choosing to come by train. Settle Lodge is an ideal base from which to explore the breathtaking scenery and picturesque villages of the Yorkshire Dales and the Forest of Bowland. Walkers of all levels of fitness will find plenty to keep themselves busy straight from our doorstep; and for the super-fit, the challenging Three Peaks walk starts from nearby Horton-in-Ribblesdale. Other activities include mountain biking, golf, rock climbing, caving and for railway enthusiasts there is, of course, the famous Settle to Carlisle Railway. We offer our guests a very comfortable stay with first–class hospitality and a friendly service. Free WiFi available for our guests.